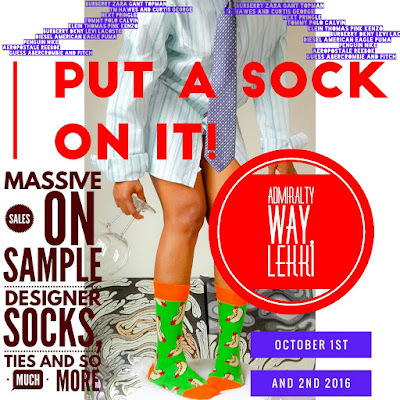 Prototype designer socks, ties and so much more will be available at this exhibition sale. The most amazing and comfortable sample pieces for gentlemen, ladies and kids. Statement socks, Emoji socks, Cartoon Characters and other incredible socks for the fashionable individual. Also available will be designer silk, wool, cotton and other classy ties to prove you mean business. All items at #PUTASOCKONIT will sell at a whooping 70% discount! So Prepare to make a statement and be at the top of your game. Come, mingle, network and shop these amazing deals on quality Socks and more this independence weekend. Date; SATURDAY OCTOBER 1ST AND SUNDAY 2ND OCTOBER 2016. VENUE PLOT 20 ADMIRALTY WAY, LEKKI, LAGOS.